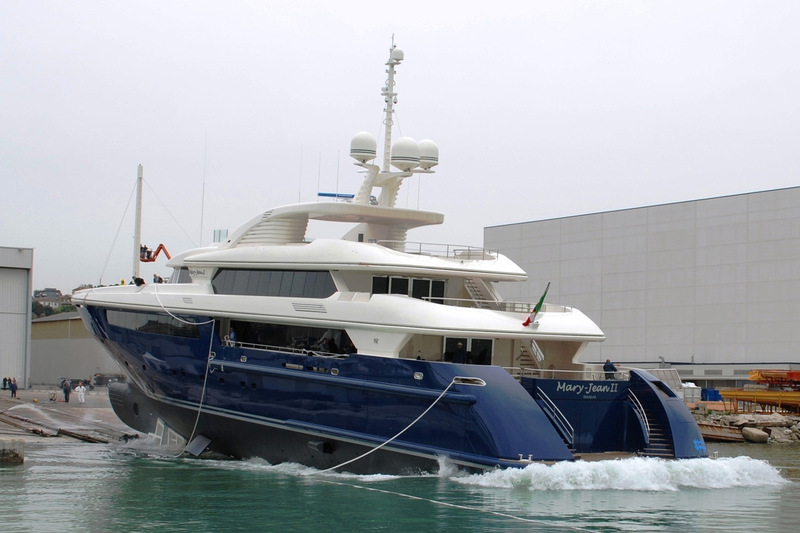 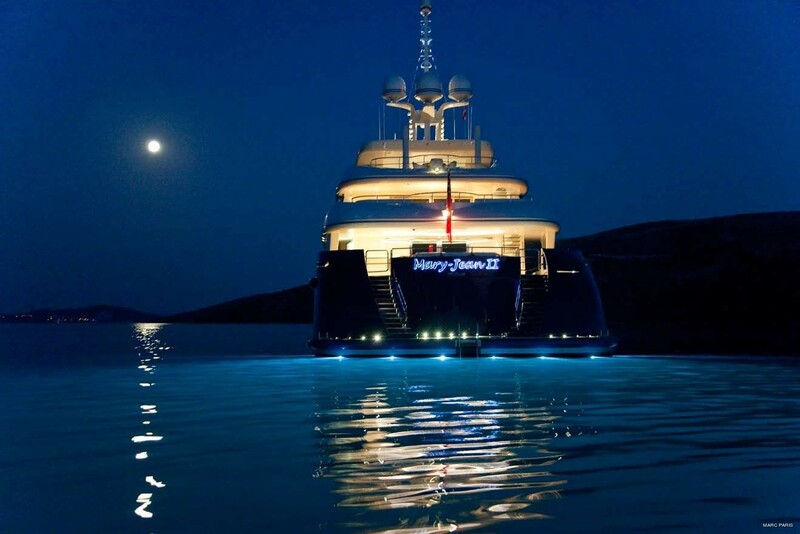 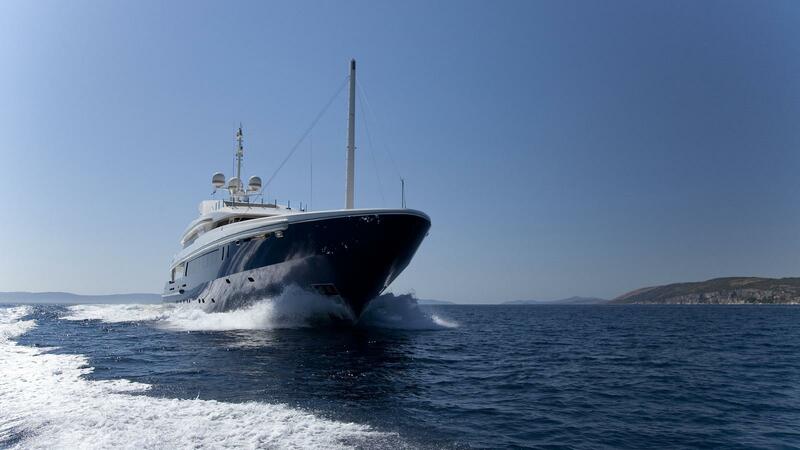 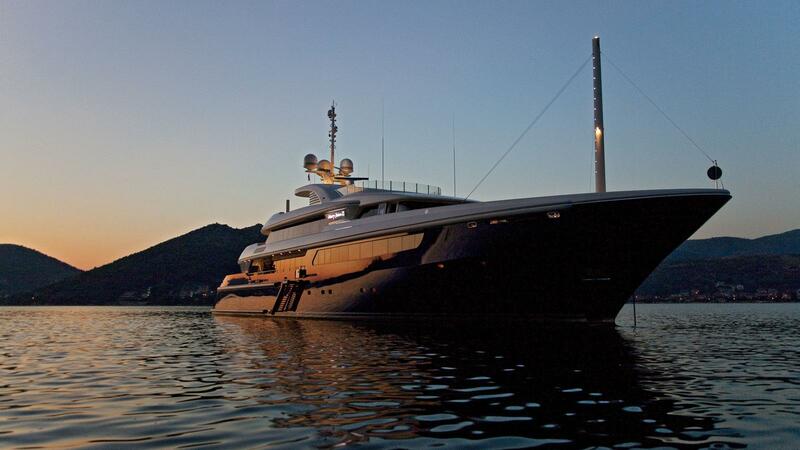 MARY JEAN II is a steel full displacement yacht of 61.70m (202' 5") in length which was launched in 2010 in Italy. 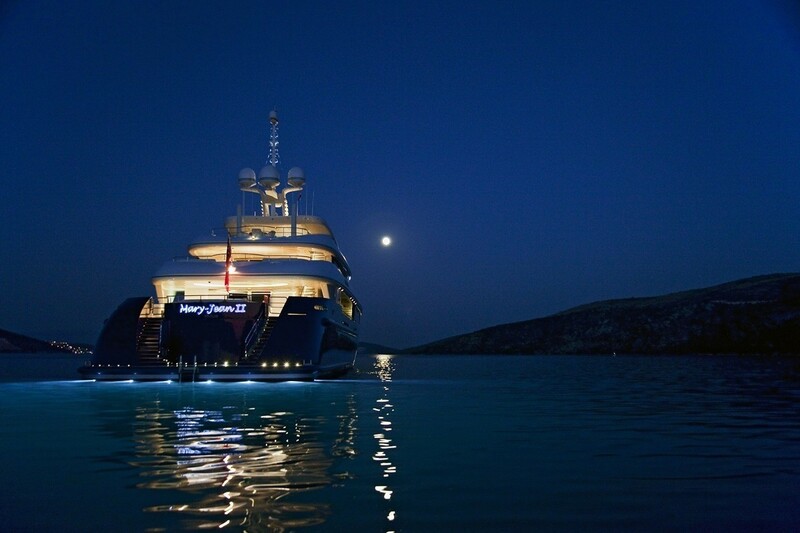 Superyacht MARY JEAN II has been very well conceived by owner and designer and also very well crafted by the Italian yacht builder ISA which produced the exterior yacht design, the naval architecture and the engineering. 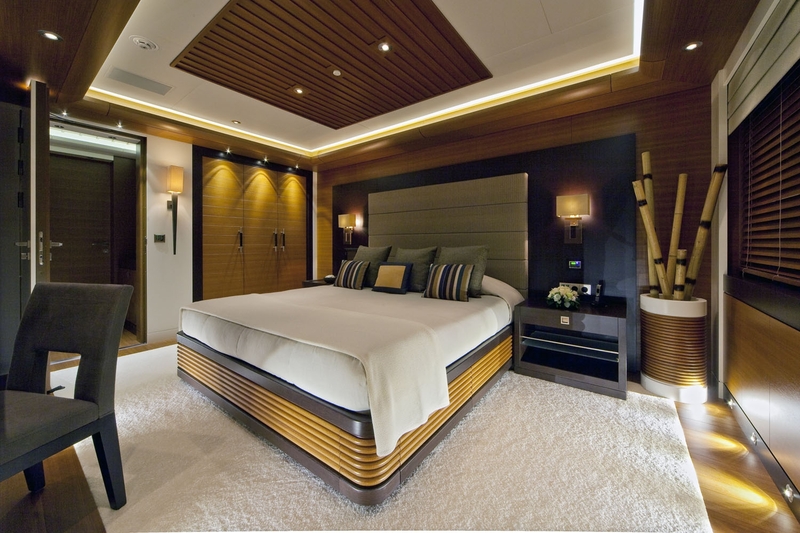 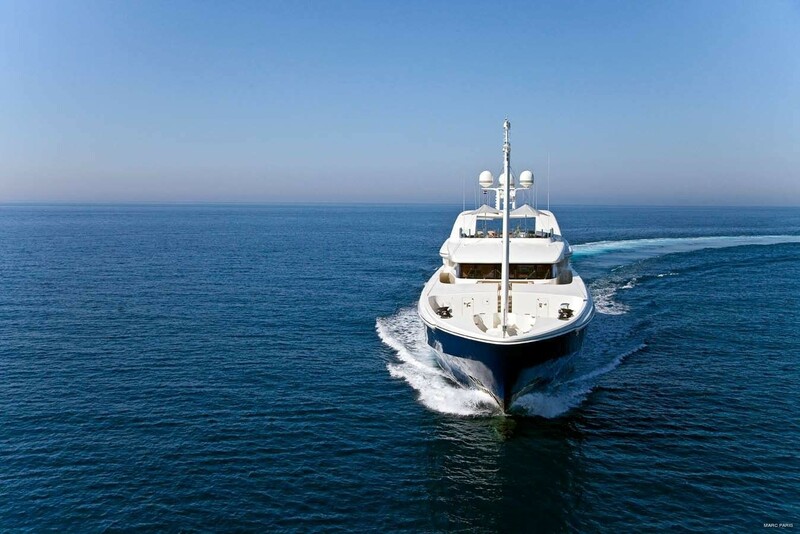 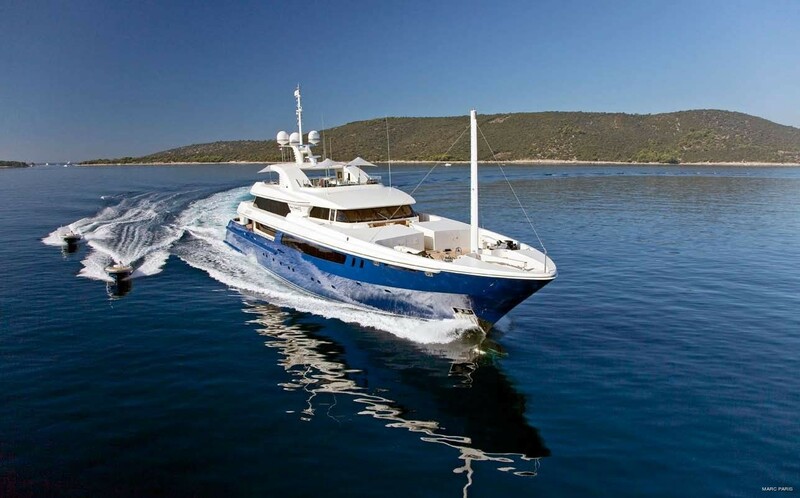 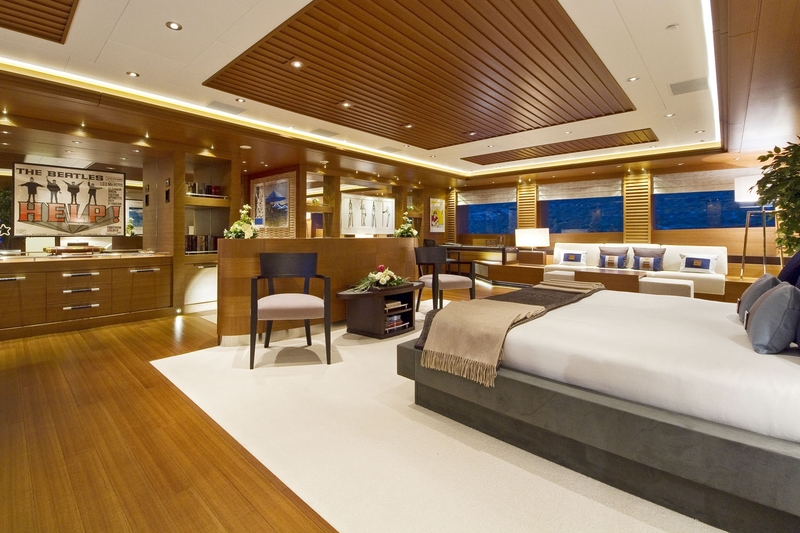 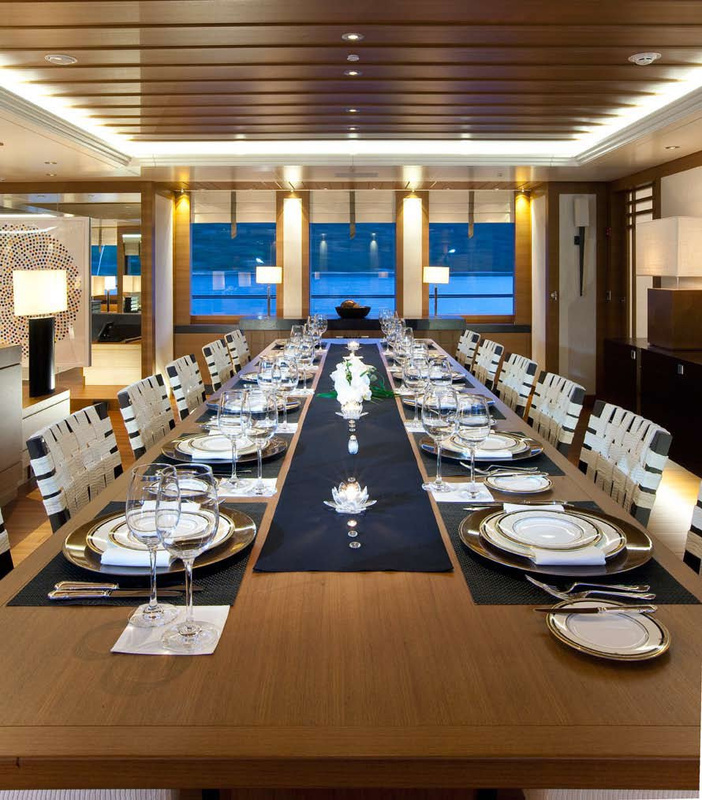 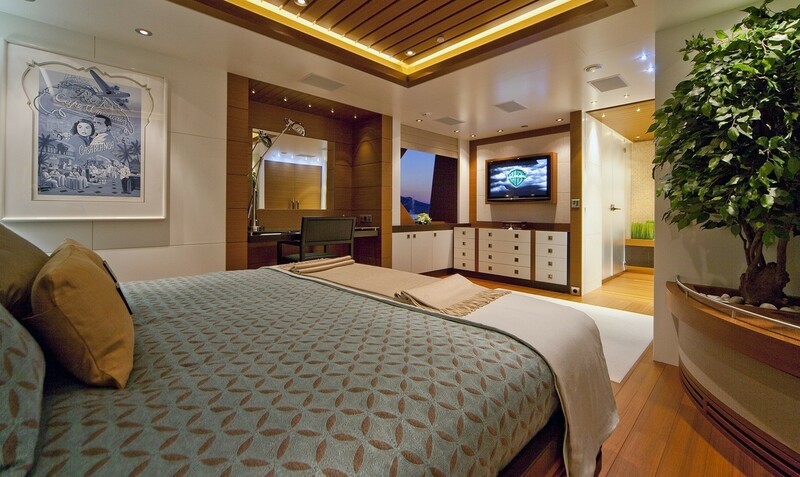 She accommodates up to 12 charter guests in 7 ensuite staterooms. 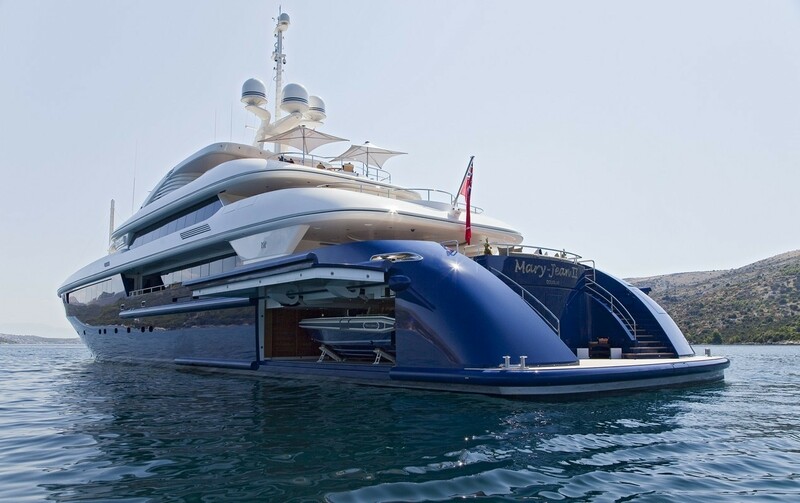 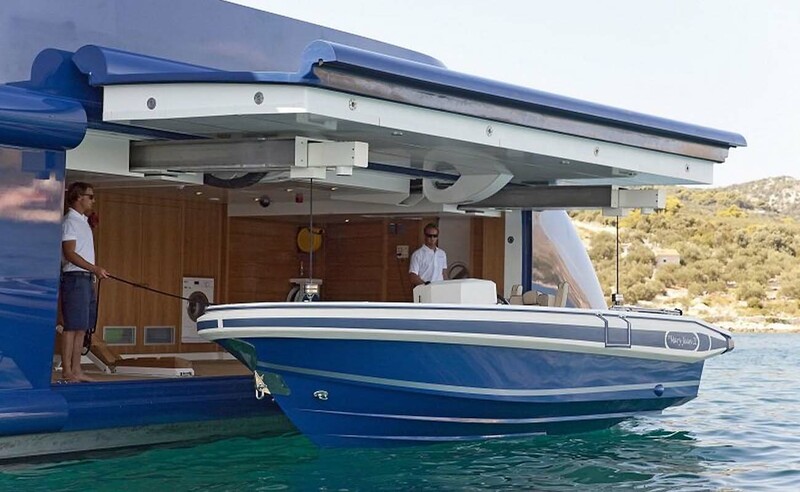 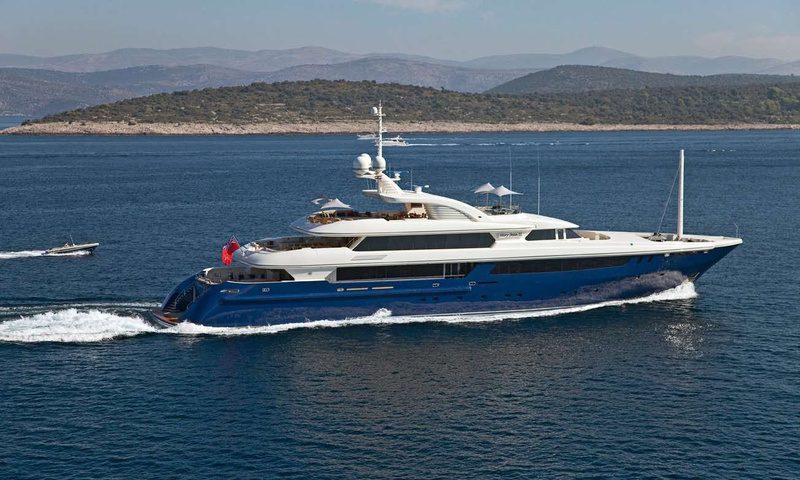 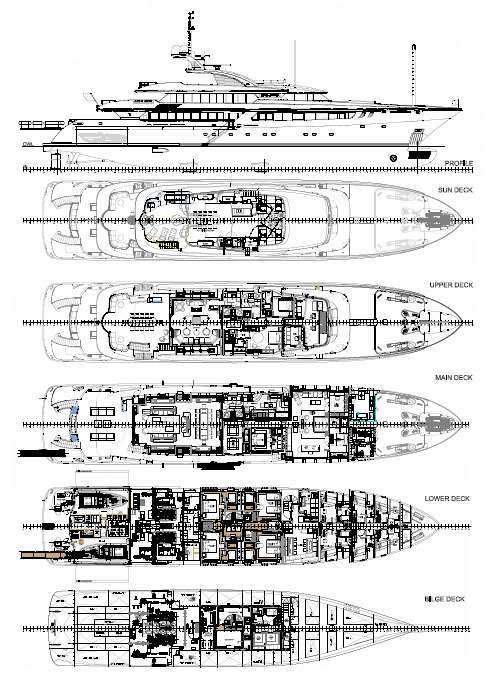 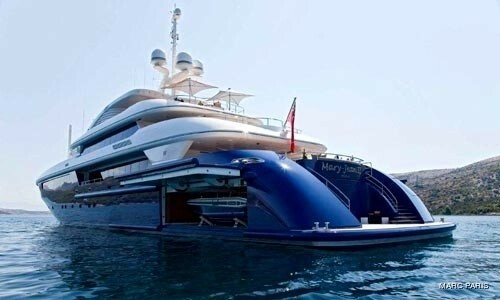 As you can see in the images, (click to maximise) motor yacht MARY JEAN II has been decorated with a wonderful blue hull. 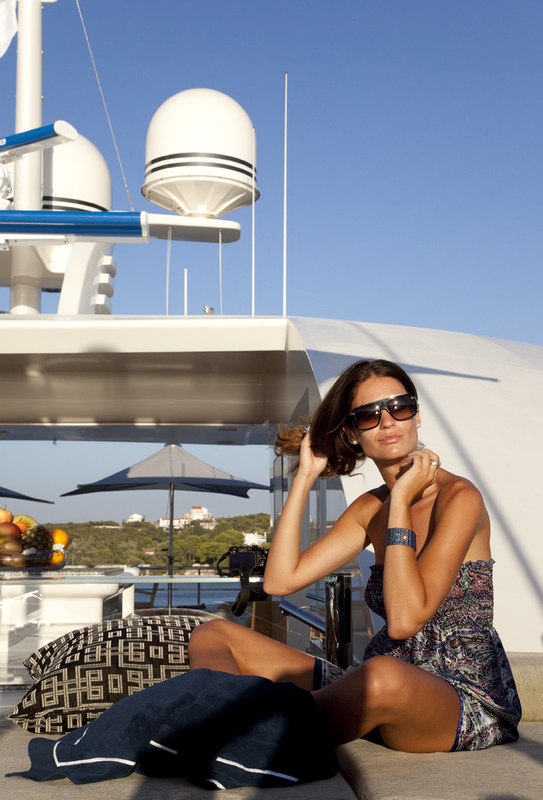 This vibrant colour, together with her modern lines, creates a very impressive and stylish image on the water. 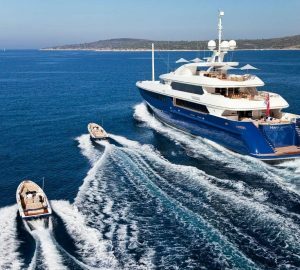 If you look more deeply, however, she also boasts the very latest yachting technology, design and some of the best Italian craftsmanship. 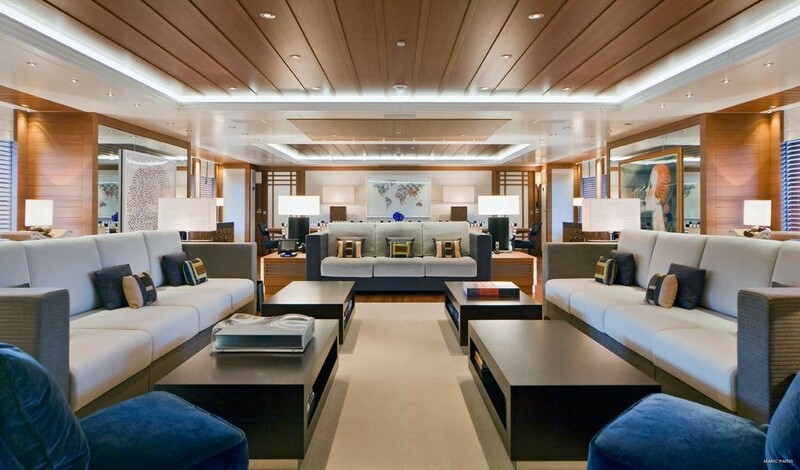 Her interior design by Mark Berryman could be described as contemporary, bright, clean with the featured use of natural woods, fabrics and art to enhance a relaxed and easy ambience. 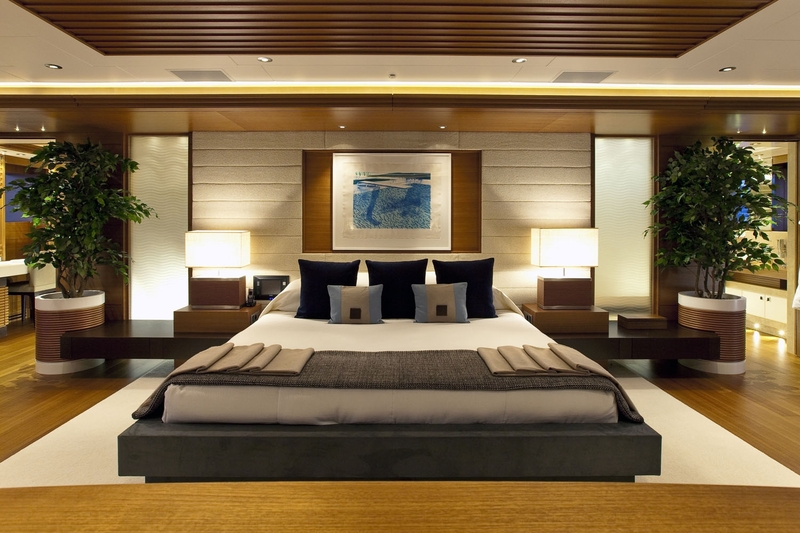 Upon entering she reveals a fresh and very well thought out contemporary styling. 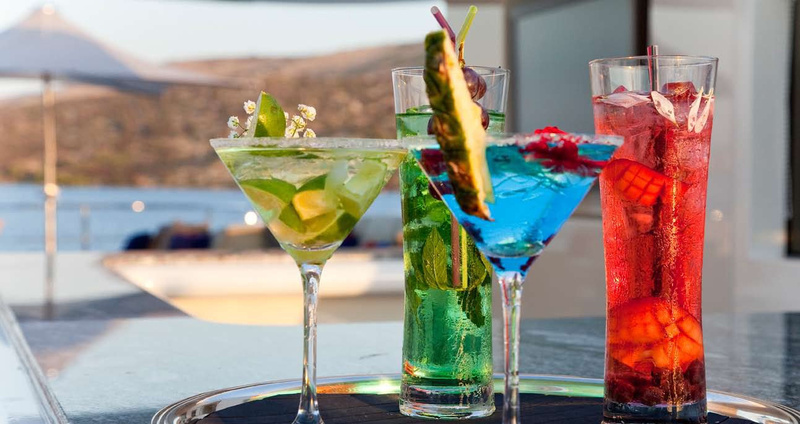 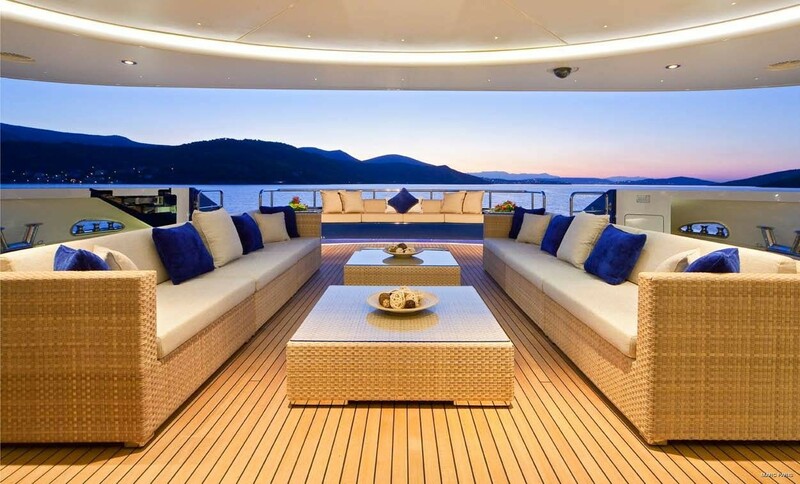 This is carried well throughout the whole yacht in creating an elegant yet youthful feel. 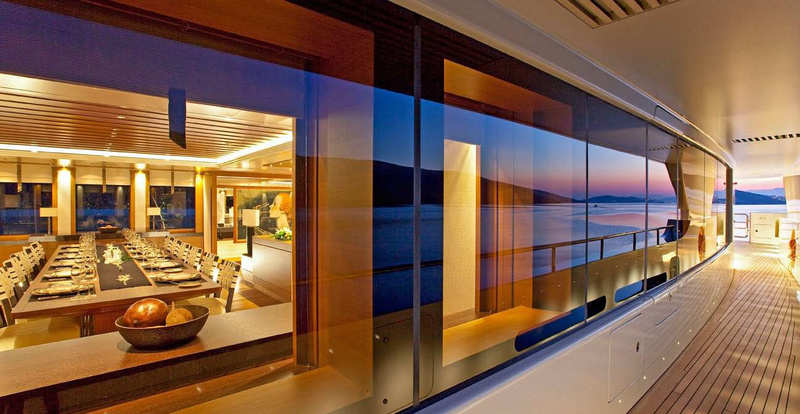 Large windows give a feeling of volumous space and her open modern feel is balanced with light grained satin woods like wengé, teak, and bamboo. 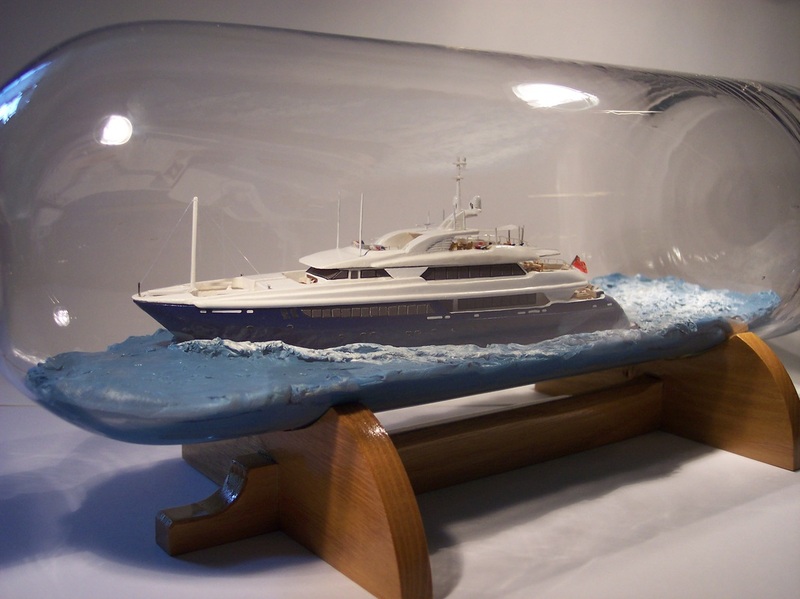 Although a private family yacht, MARY-JEAN II was very carefully and very successfully conceived and designed with entertaining and chartering in mind as the two uses very much have mutual requirements. 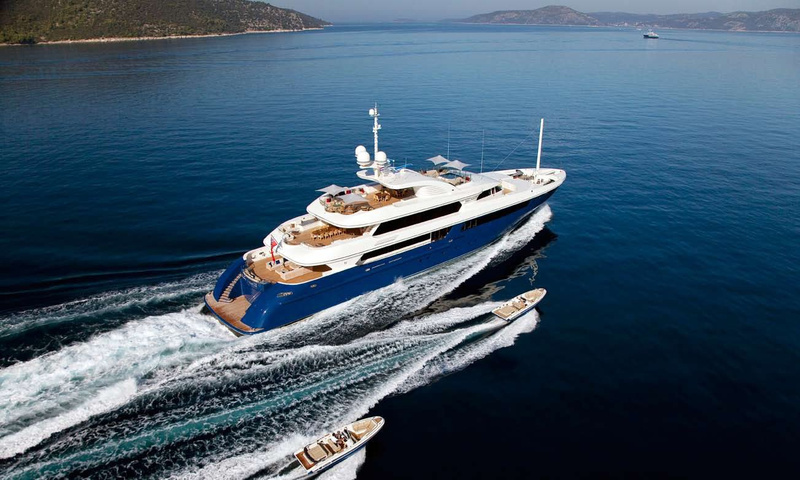 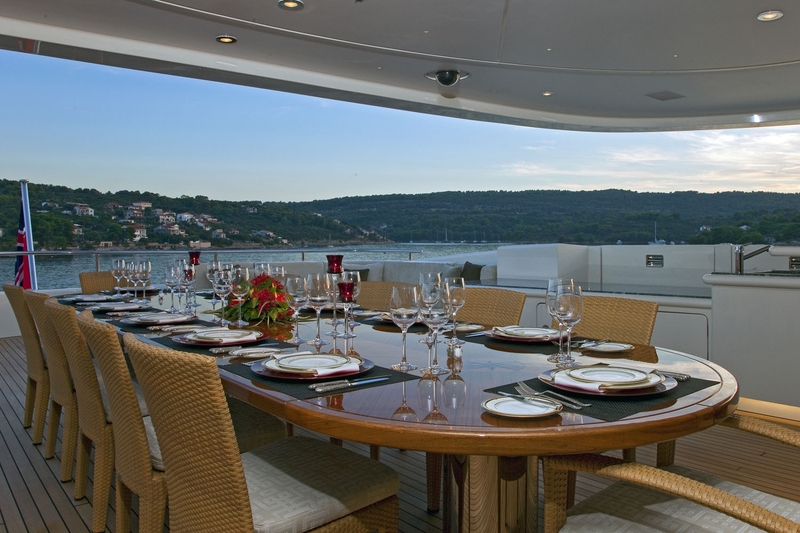 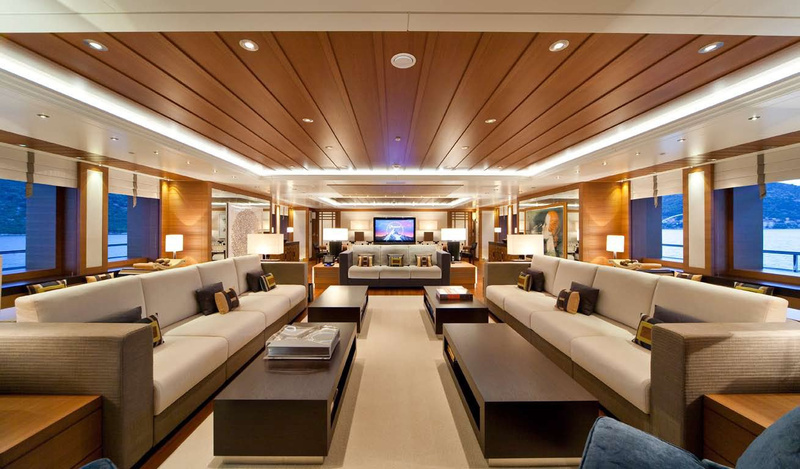 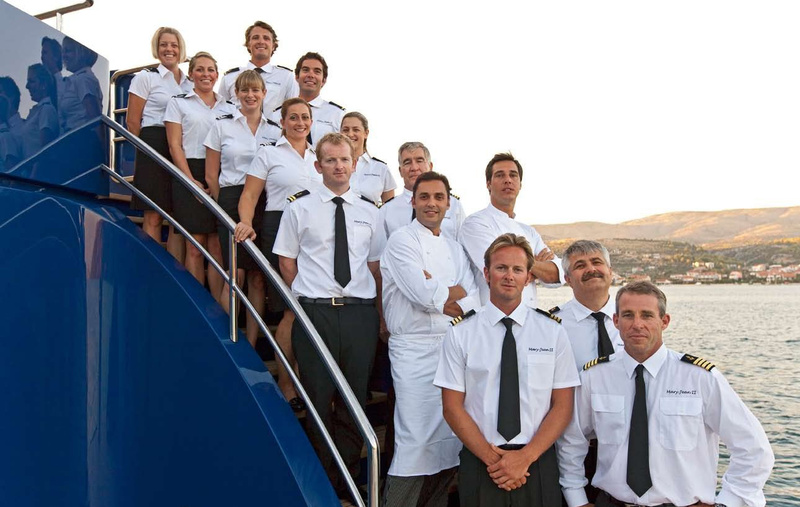 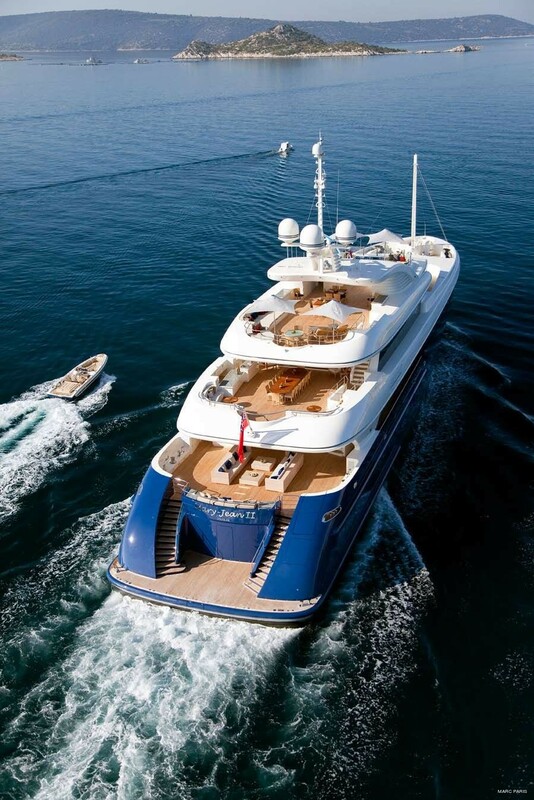 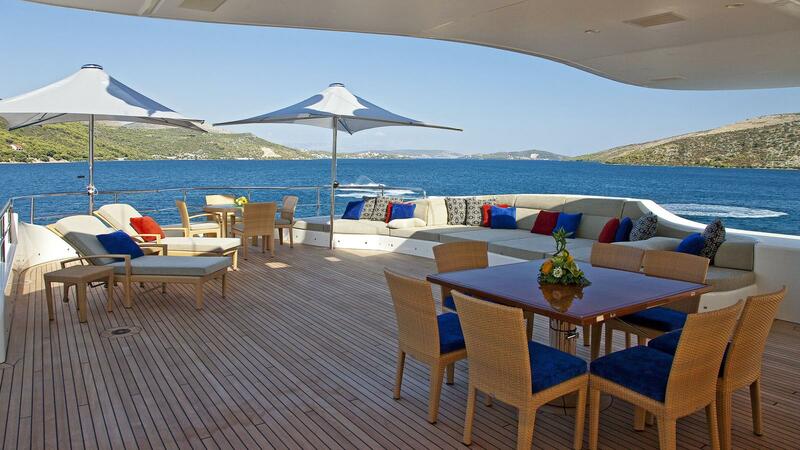 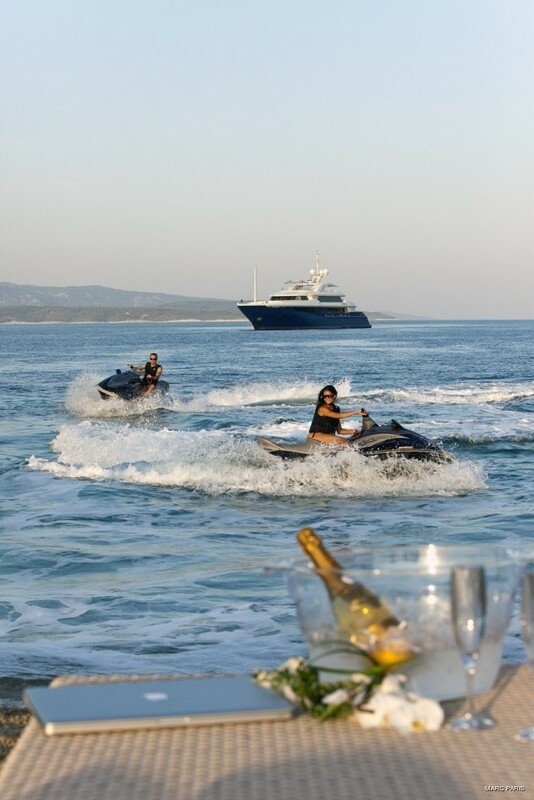 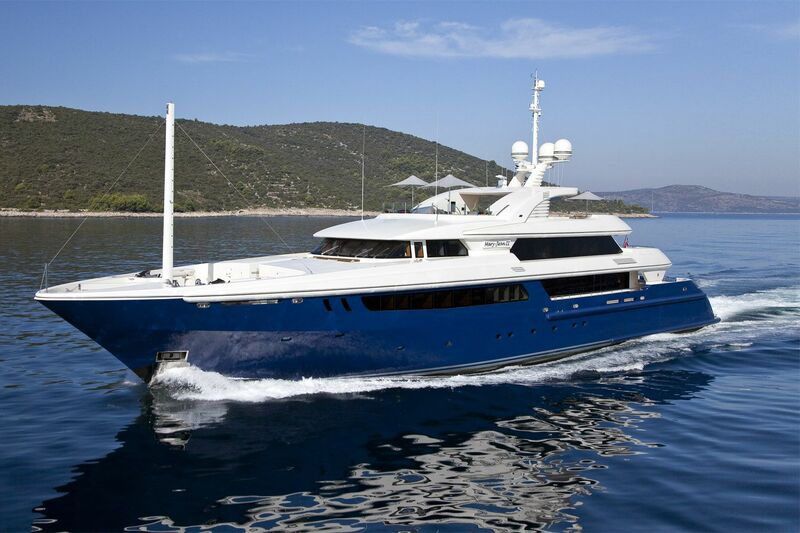 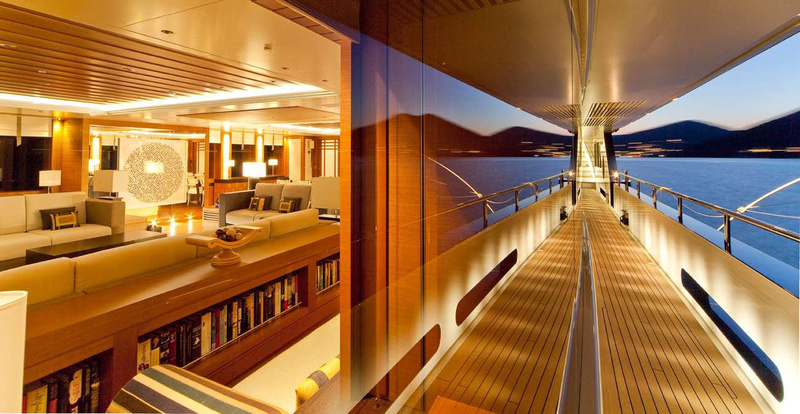 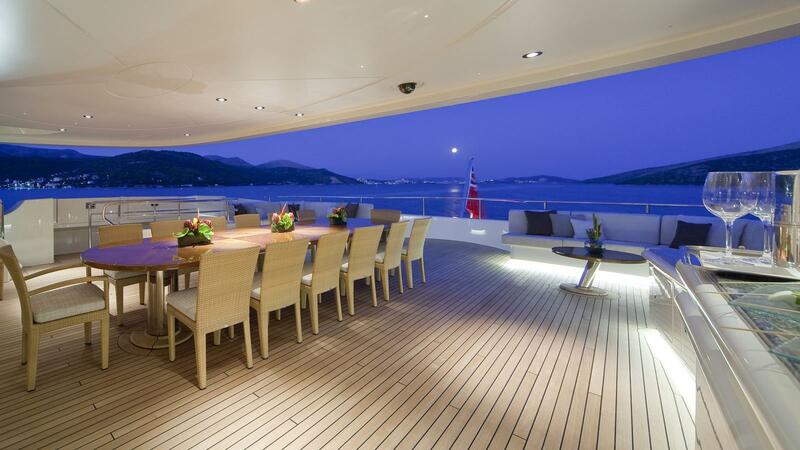 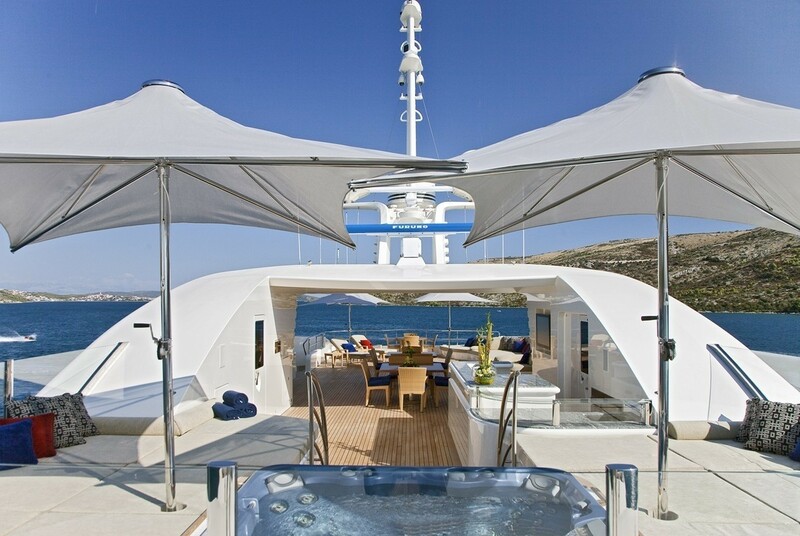 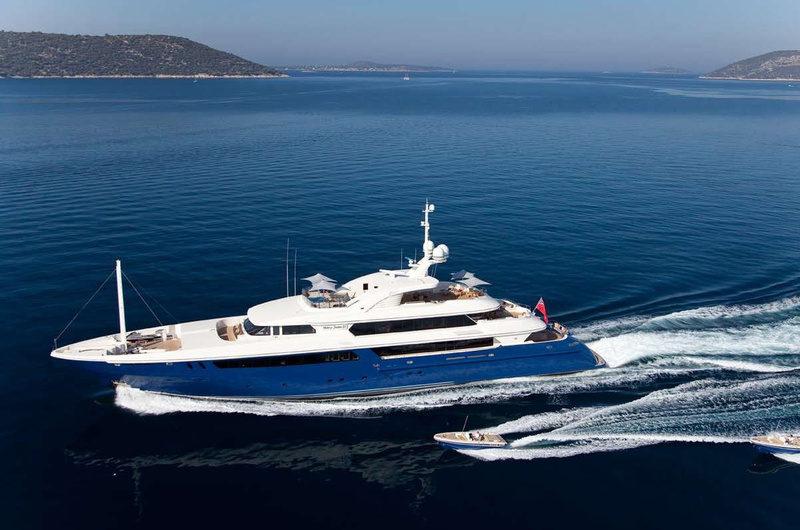 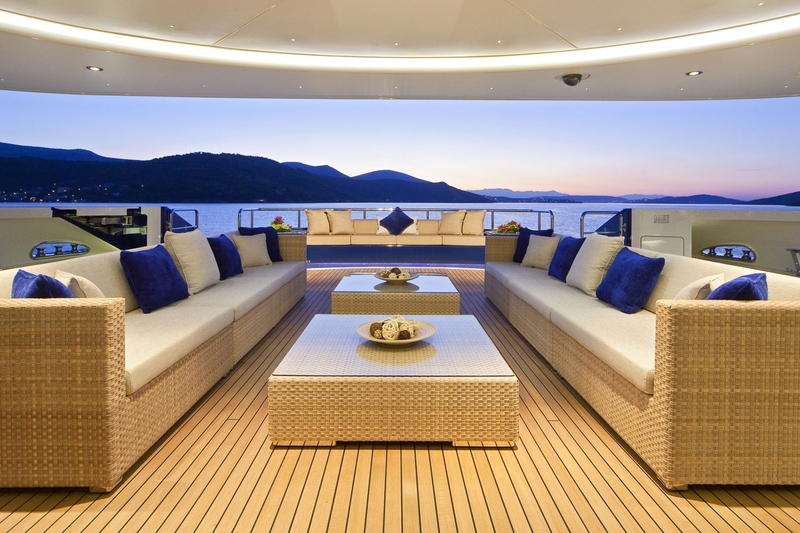 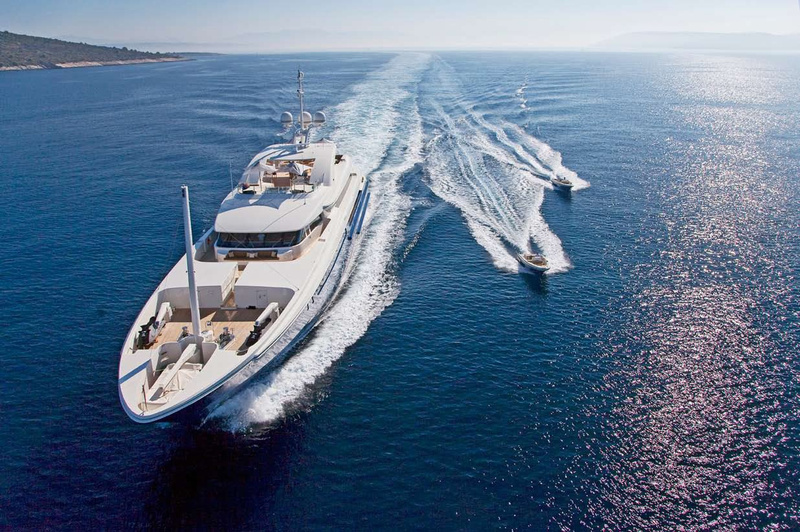 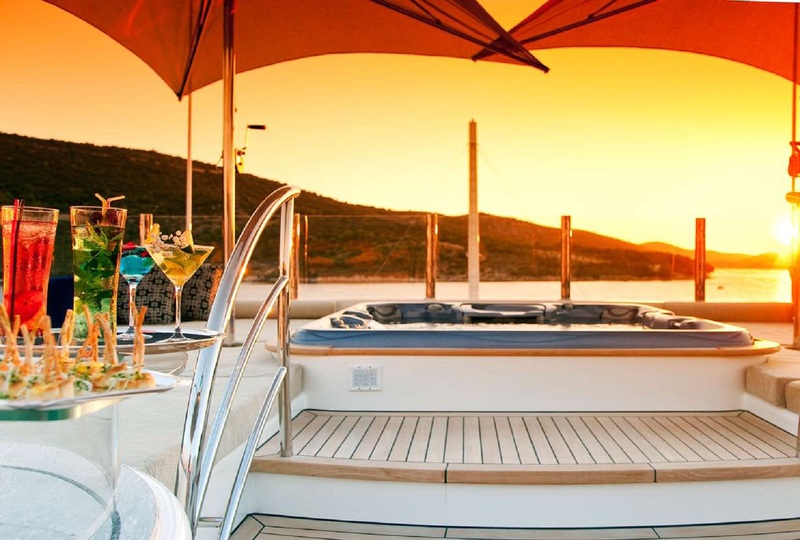 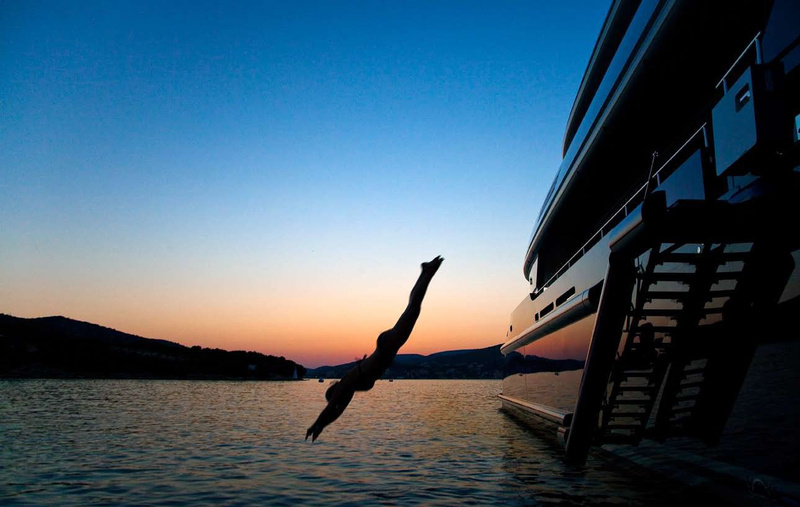 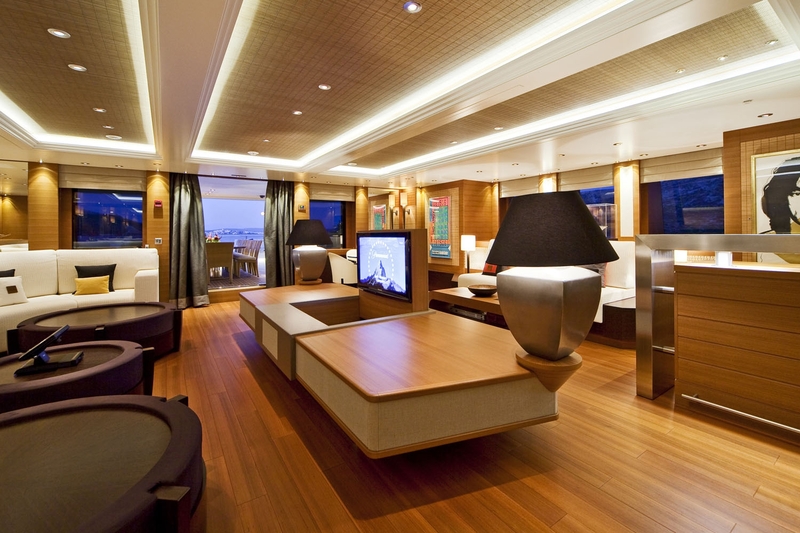 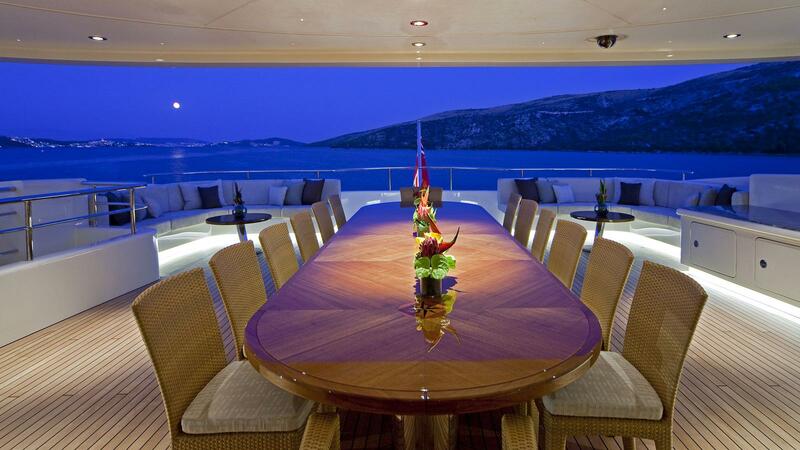 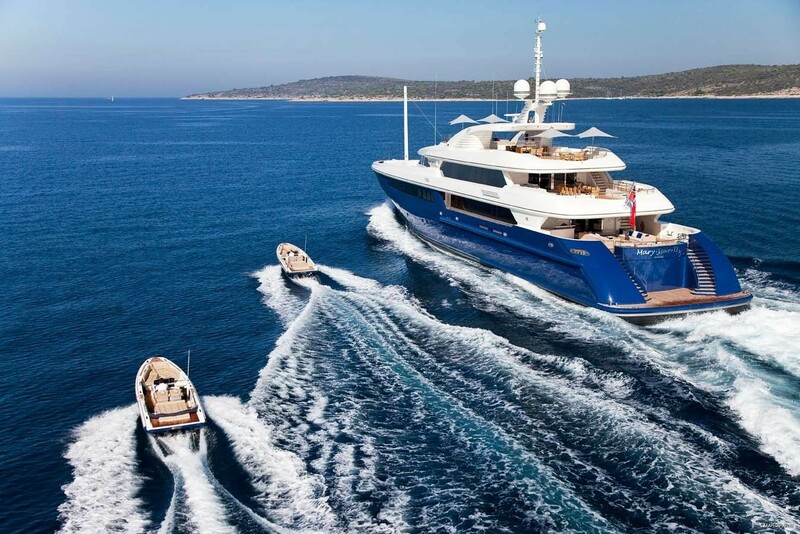 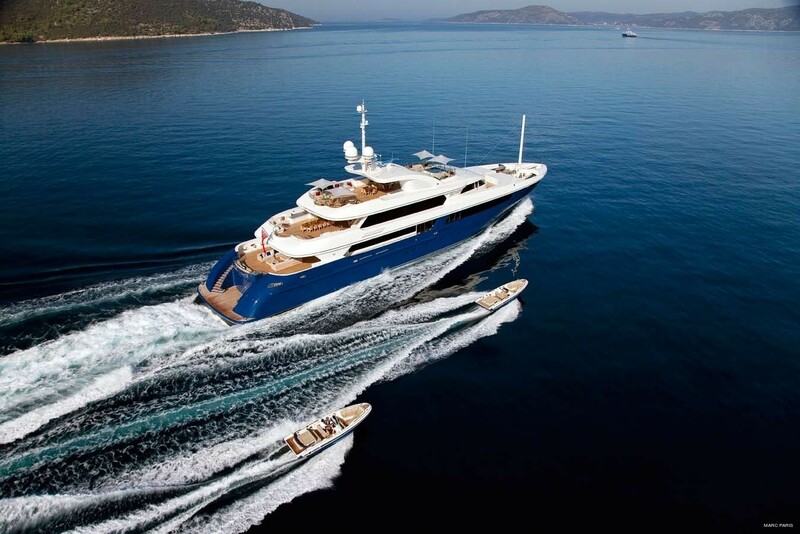 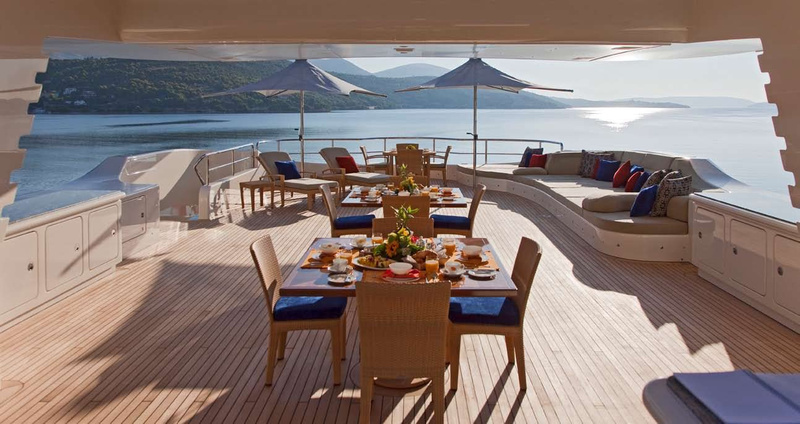 MARY JEAN II Yacht offers as many yacht charter amenities and features as you will ever see on a 60 metre motor yacht. 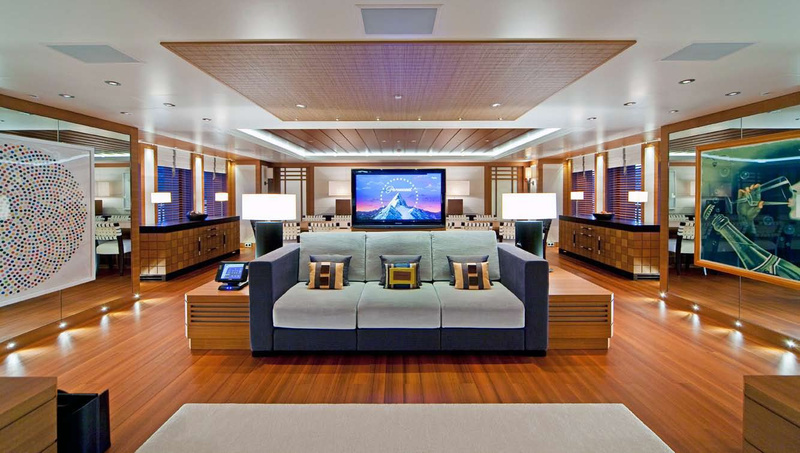 Some things worthy of comment include excellent wide and open social and entertainment spaces, both inside and out, large lobby main saloon and bridge deck lounge, a magnificent sundeck (including a generous spa pool pool), barbeque, bar, outside dining and many sunbathing areas, a tender garage, a gym, a comprehensive water toy list and a healthy cruising performance. 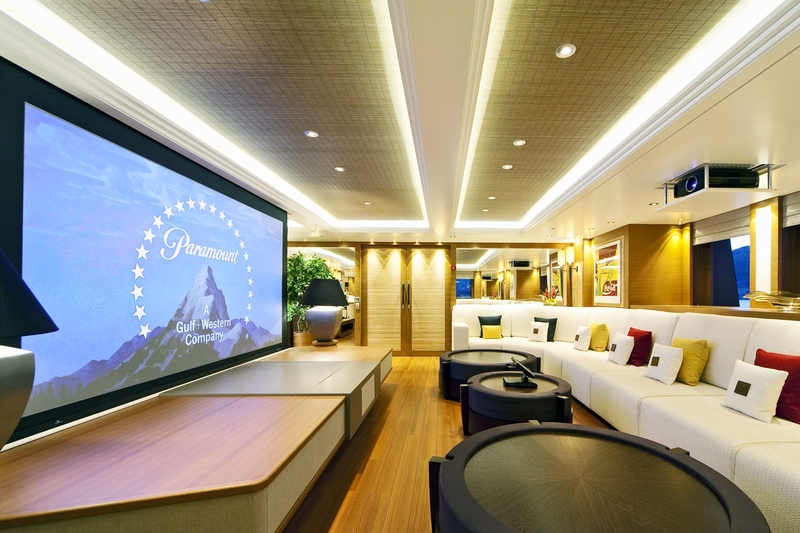 She has a very impressive sky lounge which for further entertainment houses a vast cinema movie screen and dedicated comfortable seating. 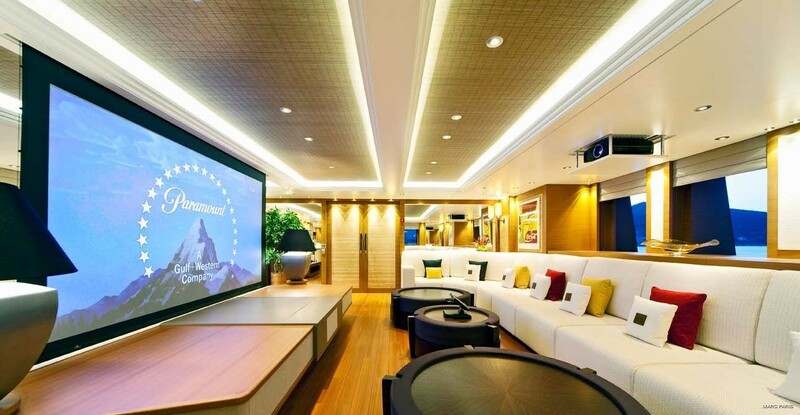 Here charterers can enjoy a vast selection of more than 2,500 movies and with an AMX remote control unit can close the blinds, dim the main lights and select the movie. 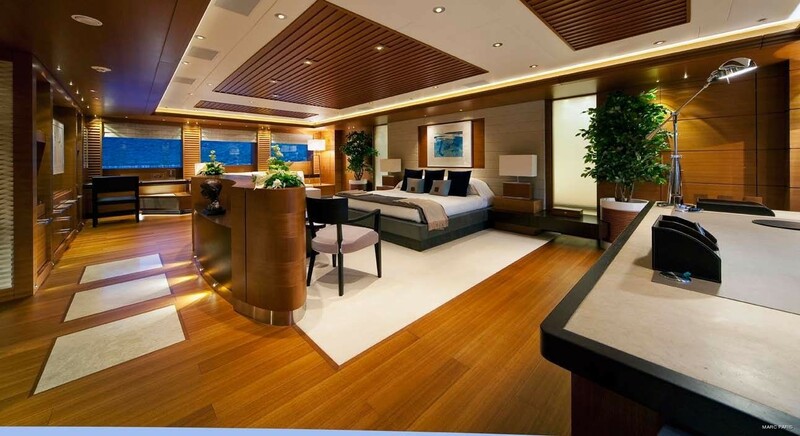 A long corridor leads to the owners' stateroom which is forward on the main deck. 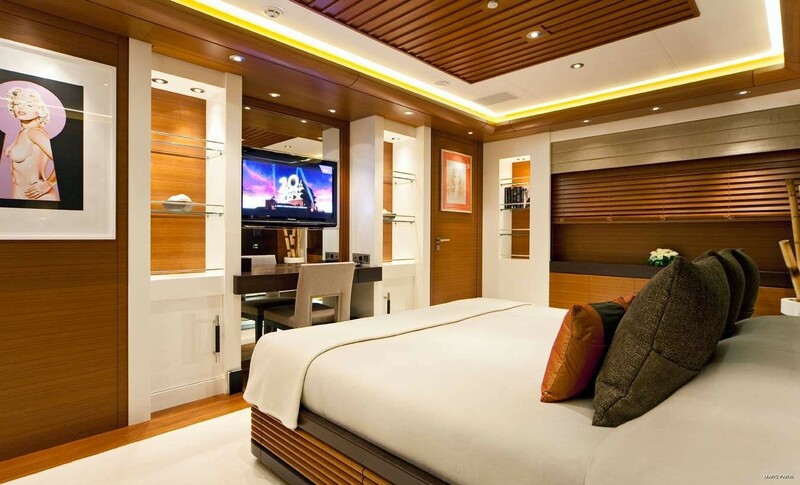 Her owner/master accommodation features a full-width Owner suite with a king size bed, a large office area, ensuite bathroom with bath and separate shower and large dressing room. 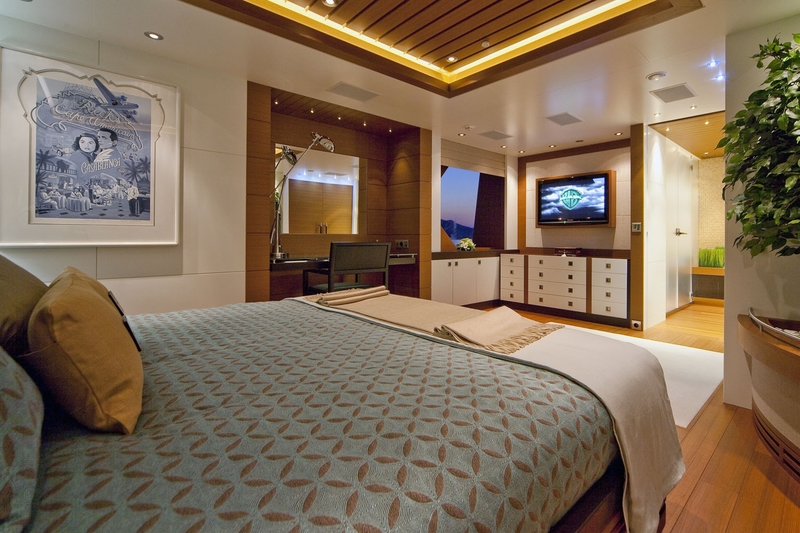 The master is situated up high on the boat’s main deck as is another stateroom which also has a king sized bed and ensuite. 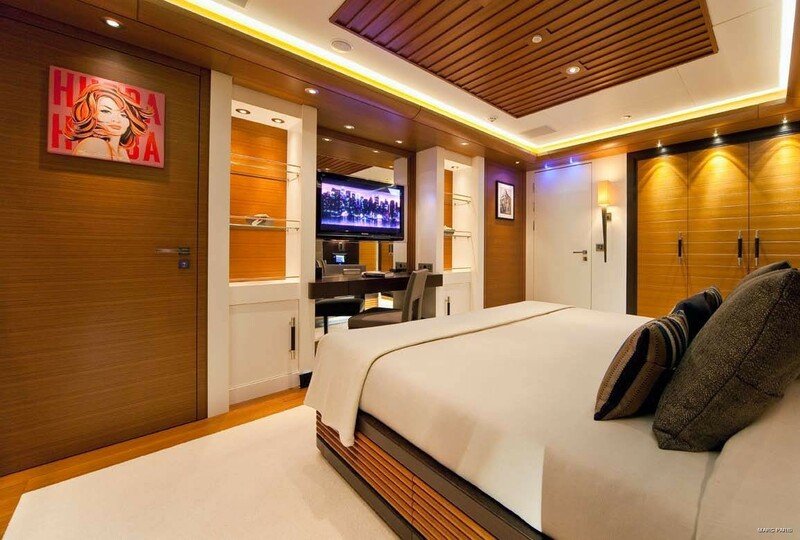 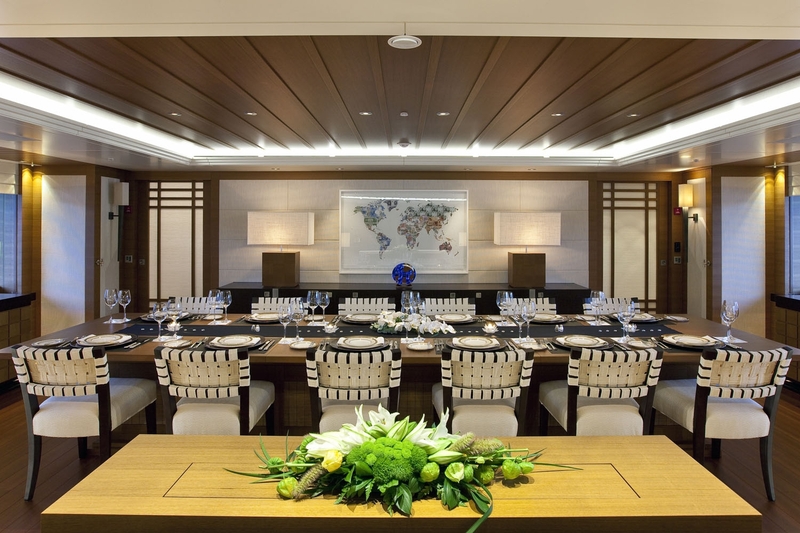 The generous VIP stateroom is located separately on the bridge deck, and there are a further four staterooms on the lower deck. 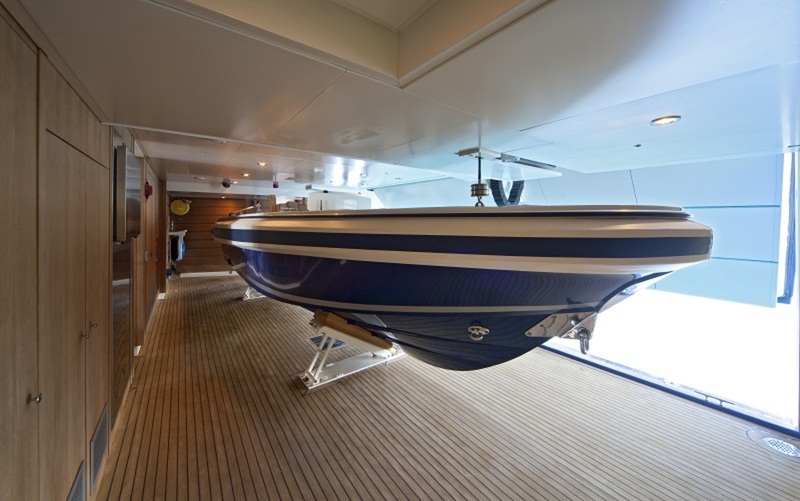 Her tenders and toys are stored neatly out of sight in the tender and toy garage. 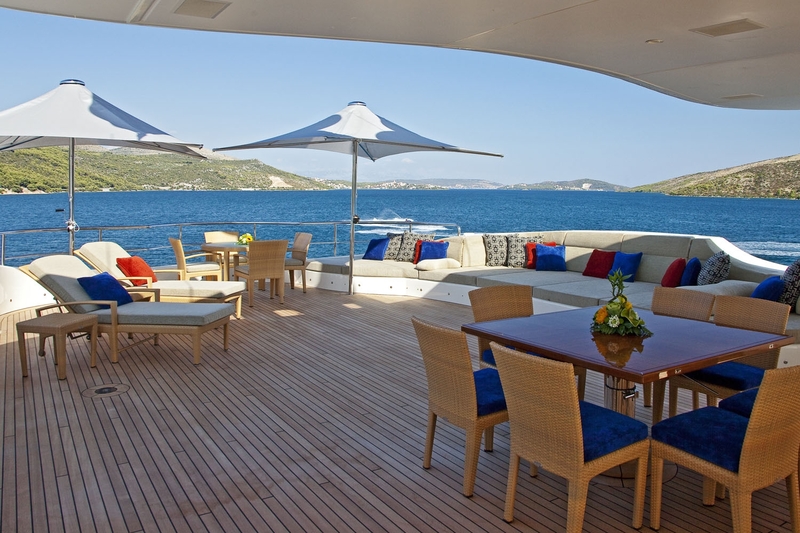 This leaves spacious and beautifully appointed deck areas which, now uncluttered, can be suitably dedicated to sunbathing, dining and total relaxation. 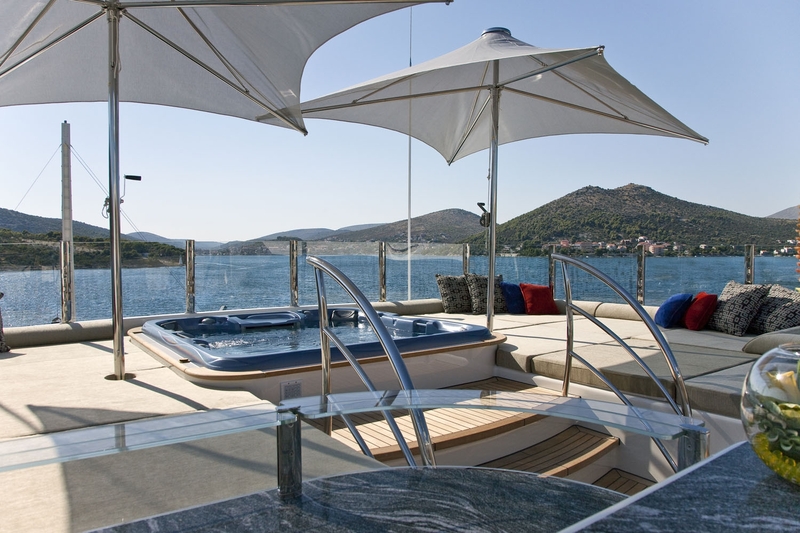 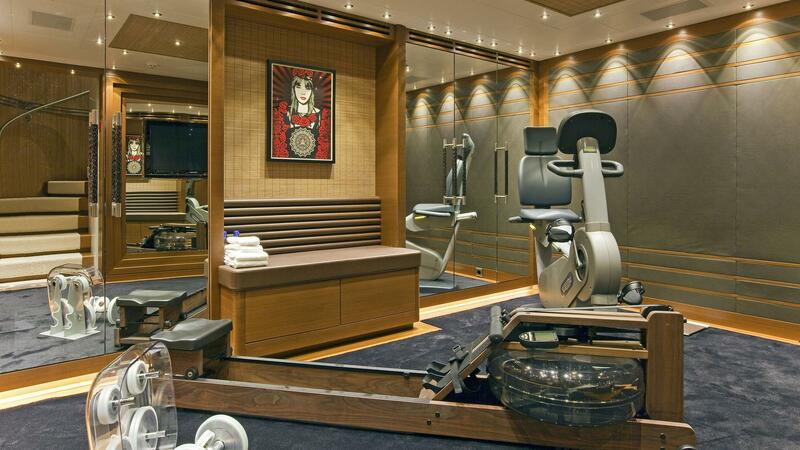 However, for those who prefer a more active lifestyle, there is a wide range of water sports equipment, as well as a dedicated gym in the stern with easy access to the swim platform and the sea. 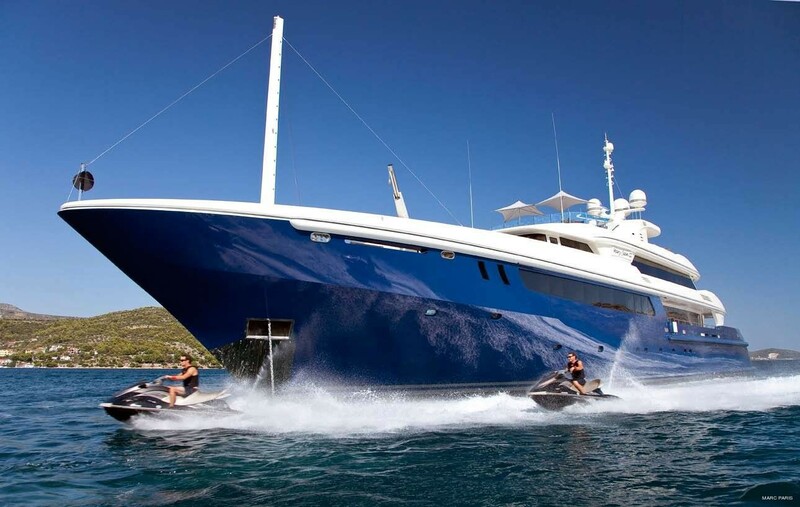 The charter yacht's twin Caterpillar diesel engines power her to a good top speed of 17 knots and give her an economical and comfortable cruising speed of 14 knots. 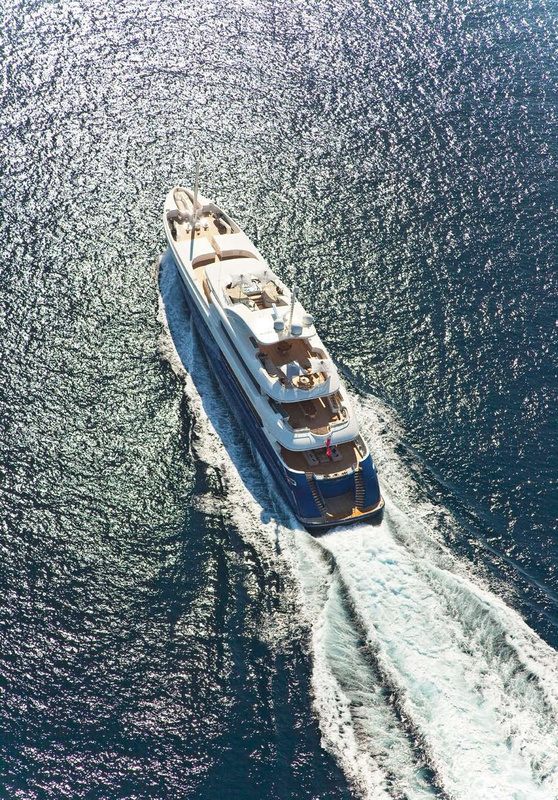 Luxury yacht MARY-JEAN II can accommodates a maximum of 12 charter guests, in seven individual staterooms, and is run by an experienced charter captain and crew of 15.